« Anarchy release! SR5 reprint with comprehensive index! The shadows just got brighter! Shadowrun: Anarchy has been out (Battleshop, DriveThru) for just over a week now, and I’m really pleased by how it’s been received. One of the things I’ve really enjoyed in my Anarchy games is the new gamemaster skills I’ve worked to developed while playing. I started out my gamemaster life as a kind of novelist/gamemaster, one who had a very definite story in mind for the players to follow. I was stubborn about this, too; I knew what the players were supposed to do, where they were supposed to get information, and things like that, and if they weren’t following the proper path, I had no qualms about stonewalling them until they got on the track. So yeah, I wasn’t a great gamemaster. But when I wasn’t running games, I got to be a player a lot, and I’ve played with a wide range of different gamemasters, with a wide variety of strengths for me to learn from. 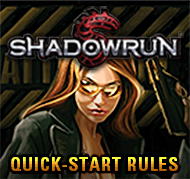 Two gamemasters in particular that I’d like to talk about happen to be the stars of the April Fool’s Shadowrun movie we made a few years back (which, sadly, seems to have disappeared from the web). One of the things I noticed about both of them when they ran games is that they were incredibly willing to take the plot in new directions based on what the players did. When we made a choice, interesting things happened. We didn’t hit dead ends—we found opportunities. This is not to say there was no such thing as a bad or inconvenient choice. There were rash or unwise things our characters did, and that affected the story for many sessions as we lived with the consequences of our decisions. But that was the thing—good or bad, our decisions had consequences and shaped the story. They did not have a planned plot so much as they had a plan to have us shape the plot. This sort of gamemastering was very much on my mind in developing Anarchy. Not coincidentally, both the gamemasters I’m referring to have significant improv experience. Anarchy refers to improv concepts repeatedly in the book, especially the “yes, and” concept of adding to what the other players are doing, instead of detracting or moving away from it. 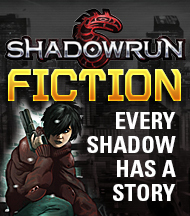 Anarchy puts the story first, and that’s led to a change in the way I prepare to run games—a change that affects the way I run Shadowrun, Fifth Edition, too. My plot preparations have been reduced; I have a few twists I’d like to introduce, but for the most part I’m gathering interesting people, places, and things, then waiting to see how the players are going to encounter them. The framework will be set by the players’ choices—my job is not to dictate what choices they make, but rather to ensure the choices they have are meaningful. That’s critical in Anarchy, because the emphasis is more on narrative than mechanics. 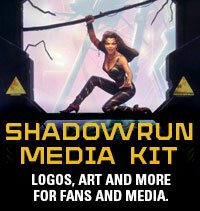 All the critical aspects of Shadowrun—magic, tech, Matrix, etc.—are there, but streamlined, and some power is shifted from game mechanics to collaborative storytelling. One of the great joys of Shadowrun is finding the exact right tool (whether that be gear, cyberware, a spell, or whatever) to make a job work right. In Anarchy, it’s less about having the right piece of gear (or, in Anarchy parlance, the right Amp), and more about coming up with creative ways to move a story forward, using what you have to inspire invention and creativity. Anarchy isn’t trying to compete with SR5’s wealth of rules, so there won’t always be mechanics for what a given item does in a certain situation (indeed, some pieces of gear have no rules at all). The plot isn’t already determined, with the players just trying to figure out what’s going on in the gamemaster’s head. Instead, they are making it happen together, from the broad strokes to the particulars of how some items work or interact with each other. That flexibility is a key part of the game, and an important way to unleash the creativity of people at the table. I’m excited to play with more people to see just how the Sixth World unfolds in their telling of it.